Every year, we look forward to looking back (ironically) at all the memories we’ve had the past year; laughing at dumb choices, crying at dumb choices, and basically reminiscing about all the sh*t we did or didn’t do. 2018 is no different. One of our favorite things to do is to look back on all the songs we’ve listened to the most this year in order to perhaps paint a picture on what our year was like. So honestly, how many times did you listen to “thank u, next” this year? On December 6, you can see your personal favorites and top-streamed tracks via the Wrapped microsite all in one playlist. Receive a playlist based on your tastes which Wrapped compiles for you, allowing you to rediscover and share the music that formed your personal soundtrack in 2018. Turns out that DRAKE is the most streamed artist of 2018 globally. With 8.2 billion streams in 2018 alone, the Canadian rapper is Spotify’s most-streamed artist of all time. Following Drake, we’ve got Post Malone, XXXTENTACION, J Balvin, and Ed Sheeran (Sheeran was the Most Streamed artist of 2017) to round out the Top 5 list of Most Streamed Artists in the world. Ariana Grande’s 48 million-plus monthly listeners raised her to the position of Spotify’s most-streamed female artist, followed by fellow queens Dua Lipa, Cardi B, Taylor Swift and Camila Cabello to round out the Top 5 Most Streamed Females in the world, respectively. 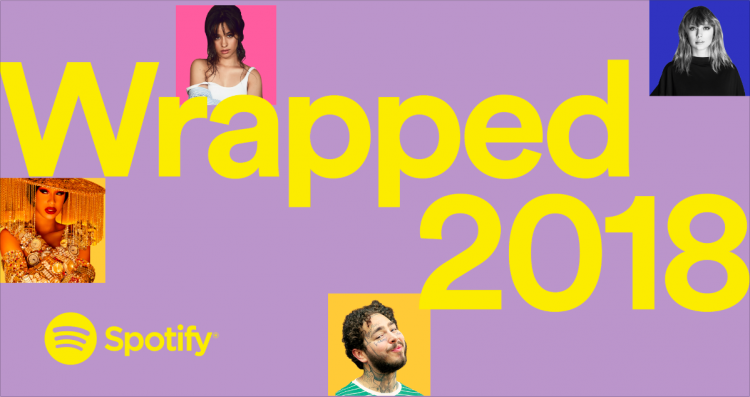 Hip-hop continued to dominate Spotify’s charts in 2018, but last year’s surge in Latin music continued its incredible growth, probably thanks to the popularity of songs like ‘Despacito’ and this year’s powerhouse single, ‘Taki-Taki’. Apart from that, EMO Rap and Lo-Fi Beats were two genres that grew the most in 2018–we don’t know what the rise of EMO Rap means exactly but we’re sure it’s not as sad as it sounds.